The nexus of robotics and autonomous systems (RAS) and artificial intelligence (AI) has the potential to change the nature of warfare. RAS offers the possibility of a wide range of platforms—not just weapon systems—that can perform “dull, dangerous, and dirty” tasks— potentially reducing the risks to soldiers and Marines and possibly resulting in a generation of less expensive ground systems. Other nations, notably peer competitors Russia and China, are aggressively pursuing RAS and AI for a variety of military uses, raising considerations about the U.S. military’s response—to include lethal autonomous weapons systems (LAWS)—that could be used against U.S. forces. The adoption of RAS and AI by U.S. ground forces carries with it a number of possible implications, including potentially improved performance and reduced risk to soldiers and Marines; potential new force designs; better institutional support to combat forces; potential new operational concepts; and possible new models for recruiting and retaining soldiers and Marines. The Army and Marines have developed and are executing RAS and AI strategies that articulate near-, mid-, and long-term priorities. Both services have a number of RAS and AI efforts underway and are cooperating in a number of areas. A fully manned, capable, and well-trained workforce is a key component of military readiness. The integration of RAS and AI into military units raises a number of personnel-related issues that may be of interest to Congress, including unit manning changes, recruiting and retention of those with advanced technical skills, training, and career paths. RAS and AI are anticipated to be incorporated into a variety of military applications, ranging from logistics and maintenance, personnel management, intelligence, and planning to name but a few. In this regard, most consider it unlikely that appreciable legal and ethical objections to their use by the military will be raised. The most provocative question concerning the military application of RAS and AI being actively debated by academics, legal scholars, policymakers, and military officials is that of “killer robots” (i.e., should autonomous robotic weapon systems be permitted to take human life?). 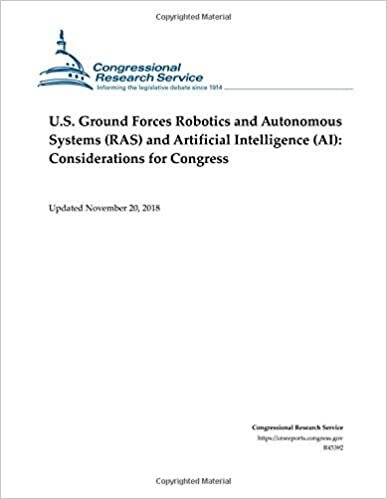 Potential issues for Congress include the following: Would an assessment of foreign military RAS and AI efforts and the potential impact on U.S. ground forces benefit policymakers? Should the United States develop fully autonomous weapon systems for ground forces? How will U.S. ground forces counter foreign RAS and AI capabilities? How should the Department of Defense (DOD) and the Services engage with the private sector? What are some of the personnel-related concerns associated with RAS and AI? What role should Congress play in the legal and ethical debate on LAWS? What role should the United States play in potential efforts to regulate LAWS?